Fall has officially begun, but things are just starting to heat up at Tierra Vegetables. Started by the sister-and-brother team Lee and Wayne James in 1980, the diverse farm in Sonoma County grows heirloom beans, corn, and a variety of vegetables. And October is all about chile peppers. While many crops are withering from what may be the hottest year on record, peppers thrive in the heat, and the really hot ones are ripening right about now. “They’re a picky kind of plant,” says Lee of the hot chiles. “The seeds germinate more slowly than other peppers. They take a little longer to mature, and they require more heat.” For chile heads, these prized hot peppers are worth the wait, and once the fresh ones are gone, Tierra preserves them so you can turn up the heat well into winter. Tierra started growing sweet peppers in their early days, along with a few hot pepper varieties for decorative ristras. As customers began cooking with hot ones, the Jameses started growing more of them. Some years ago, a Ferry Plaza Farmers Market customer brought Lee a habanero plant—a variety his grandfather in Jamaica grew—to see if she could plant it on her farm. Tierra’s love affair with hot peppers took off from there. Jalapeños, serranos, and even habaneros are a familiar sight at most grocery stores, but the variety generally stops there. At farmers markets, you’re much more likely to find some the hotter chiles, many of which belong to the Capsicum chinense species. Native to the tropics of the Caribbean and Central America, these scorchers tip the Scoville scale, a rating developed by the pharmacist Wilbur Scoville in 1912 to measure levels of capsaicin, the compound that makes peppers spicy. Sweet bell peppers have 0 Scoville heat units (SHU), jalapeños range 2,500 to 10,000 SHU, and police-grade pepper spray is 2 million SHU. These high SHU peppers can cause sweating, crying, heartburn, and worse, so why would any rational person subject themselves to such pain? 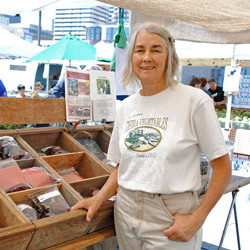 But beyond the heat and the high, hot chiles also have rich and fruity flavors, as any serious chile lover will attest. “The flavors in some of those peppers are intense, but you’ve got to know how to use them,” according to Lee. The burn can mask the underlying subtleties. Condiments and preserves can channel and control the heat, and the Jameses have found a variety of ways to extend the chile harvest through value-added products sold at their Ferry Plaza stand. “We’ve gotta process them somehow because they all come at the same time, at the end of the season,” says Lee. For years, Tierra has made dried and smoked chiles for use in soups and Mexican dishes like moles, enchiladas, and posole. Their chile jams are perfect for dabbing on crackers with goat cheese, or as a dipping sauce that adds a sweet and spicy kick to vegetables and dumplings. Then of course, there are the hot sauces, made in a Caribbean style using vinegar, salt, and peppers. The hotter varieties are generally blended with sweeter peppers to smooth out the flavors, and offered in a range of flavorful varieties that put Tabasco to shame, like Inferno, Corno di Toro, and Ají Panca. Most recently, Tierra started offering flavored chile oils, using Sciabica & Sons olive oil as a base, great for dipping bread, drizzling on popcorn, and mixed into salad dressing. For the exceptionally hot chiles like the ghost pepper, Lee’s favorite preservation method is chile salt. Fresh chiles are ground into salt, which acts as a preservative and makes it easier to mete out the pepper in tiny, more palatable doses. While restaurants tend to steer clear of the really spicy peppers, chef Eric Tucker has been paying tribute to Tierra’s chiles since 1998, when he started hosting his annual chile dinner at the Bay Area vegan mecca Millennium Restaurant, now located in Rockridge. 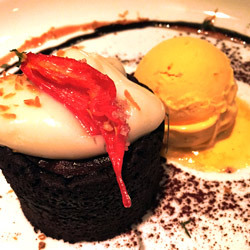 On Monday, the Millennium kitchen staff visited the farm to harvest chiles, and last night, they hosted their spicy feast, with menu items like Indian spiced green tomato and melon soup with tamarind-Jolokia chutney, and molten chocolate cake with Chihuacle chile ganache, sweet habanero ice, and (the final kick) candied Paper Lantern chile. Like any good thing, chiles are perhaps best enjoyed in moderation. Creating a chile-infused menu means spreading out the heat, tempering it with cooling agents like coconut yogurt, and letting diners spice to their personal taste through salsas, condiments, and pastes. “It’s about showcasing the different flavors and nuances,” says Eric. Can you take the heat? 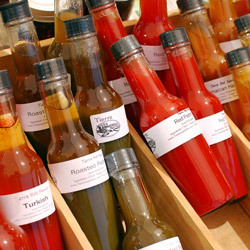 Stop by the CUESA hot sauce tasting station with Tierra Vegetables sauces at the Mission Rock Farmers Market Pop-Up this Sunday, September 27. You can also find spicy peppers at Tierra Vegetables, Happy Quail Farms, and other growers at the Ferry Plaza Farmers Market on Saturdays.